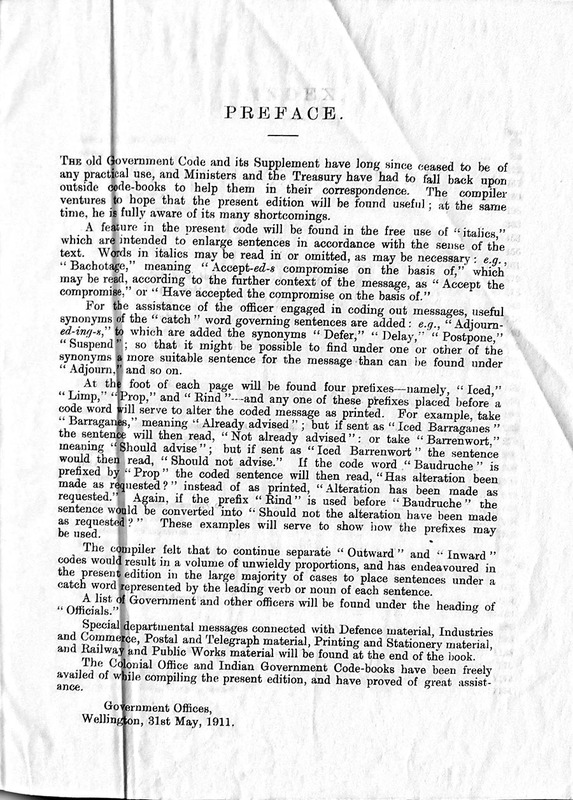 Gathered here are descriptions and specimen pages of government telegraphic codes; two of them were used in colonial administration. I have excluded military, meteorological and public health codes, as well as diplomatic codes. Click on the year of publication, to be taken to discussion of that code. This is a new page, created on 3 October 2018. I expect to make revisions and additions in coming days and weeks. In their phrase selections, these codes reflect the political and administrative complexities of those realms in which they were used. This is most strikingly on display in the India Word Code. In a sense, they are a-historical abstractions from the circumstances in which they were used: context is absent, only fragmentary language is presented (albeit in an orderly fashion). from an appendix to the 1933 Government Telegraph Code, here. by J. H. Lane, Indian Government Telegraph Department. I have owned a copy of this code for years, and neglected it. The reason: it is organized alphabetically, by codeword, and is thus usable only for decoding, not coding. Its phrases are random. 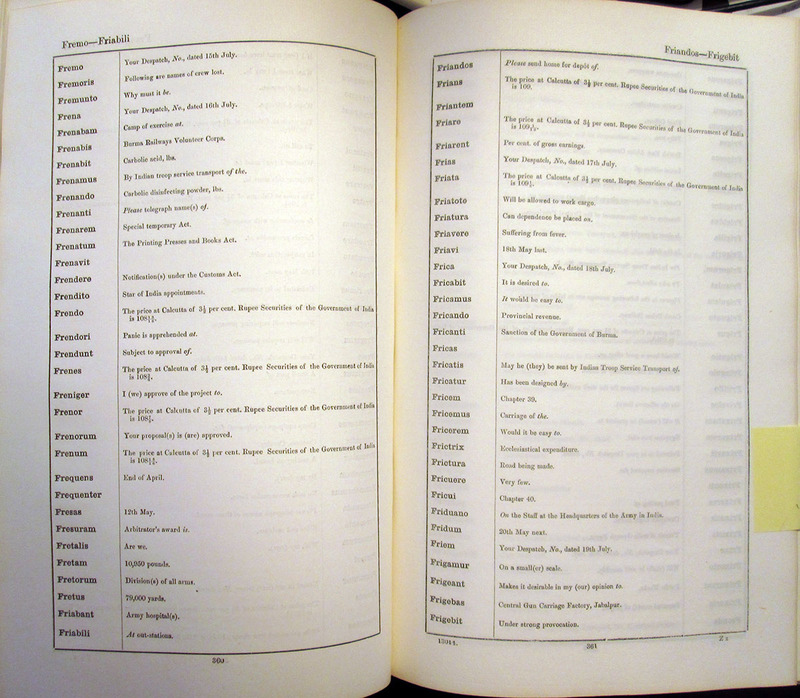 The more interesting volume, I thought, would be Part I, in which phrase elements would presumably be organized in a mix of alphabetical, onomasiological (thesauric) and tabular orders. My copy of Part II was not interesting enough, I thought. And yet. Close inspection of this volume, in search of the makings of poetic derivations, suggests to me that Part I could be generated out of Part II. Slow trawling through its pages does give a sense of the habitus in which it was used. 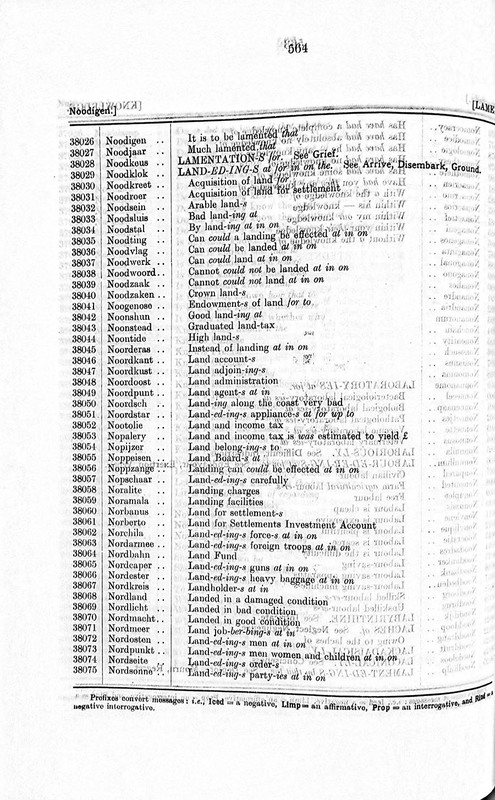 references to revenue and ordinary despatches, and telegrams (and dates of sending); current values of government securities; dates (of the year, and calendar and fiscal years); movements of troops; promotions and pensions; legal proceedings (including sentencings); departures and arrivals; public works; public health (including epidemics and the like); floods; political dealings with native notables; public order (riots, unrest, etc.). Here also are phrases — about discretion, or embarrassment, or dilemmas, ambiguities, indignities, perplexity, etiquette — that are not often found in other codes. I will provide examples indicating this range of topics, soon. 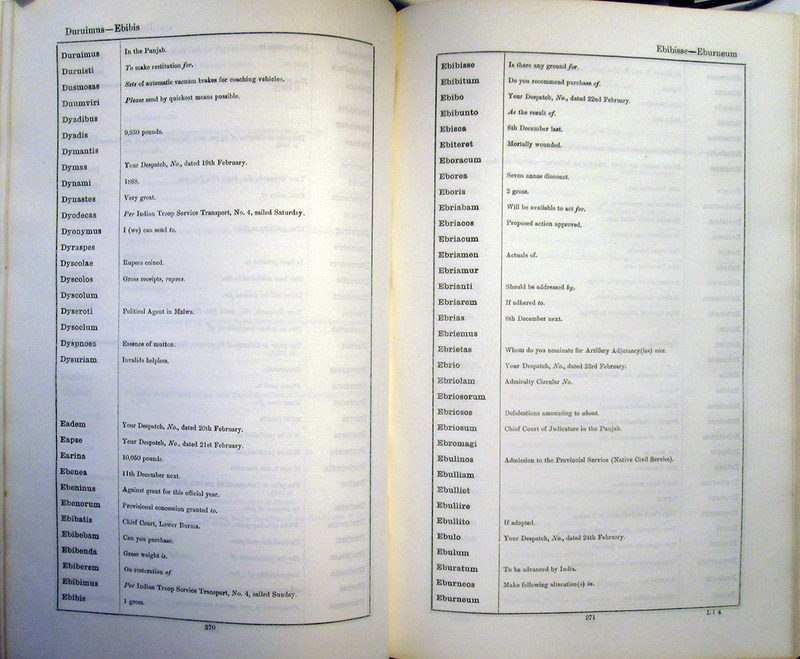 Some specimen pages are shown below. 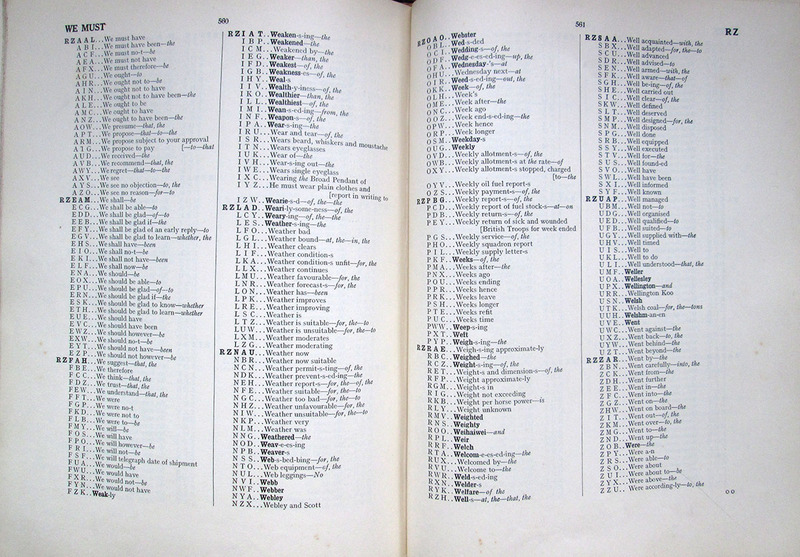 1,161 pages, containing nearly 70,000 codewords (and their respective phrases or tabular elements). 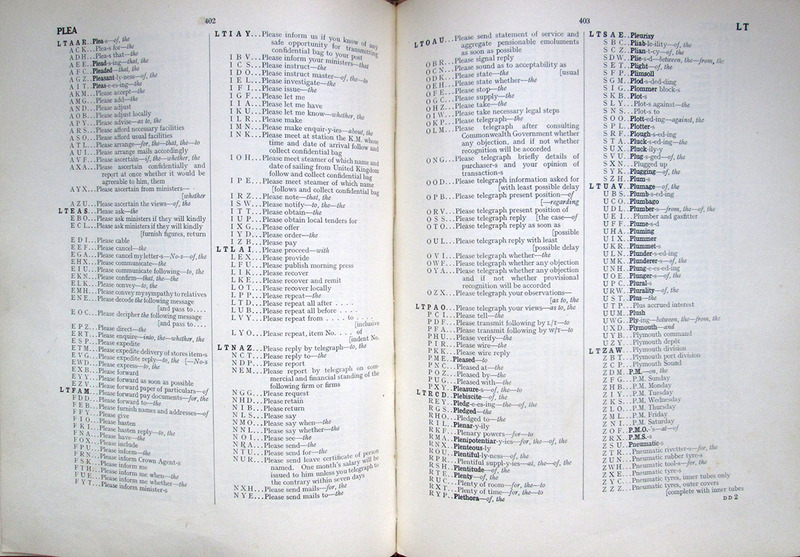 Codewords are taken directly from the New Official Vocabulary (four volumes, 1899-1901) — Aabam, Aaboras, Aachenense, Aacia, and so on. 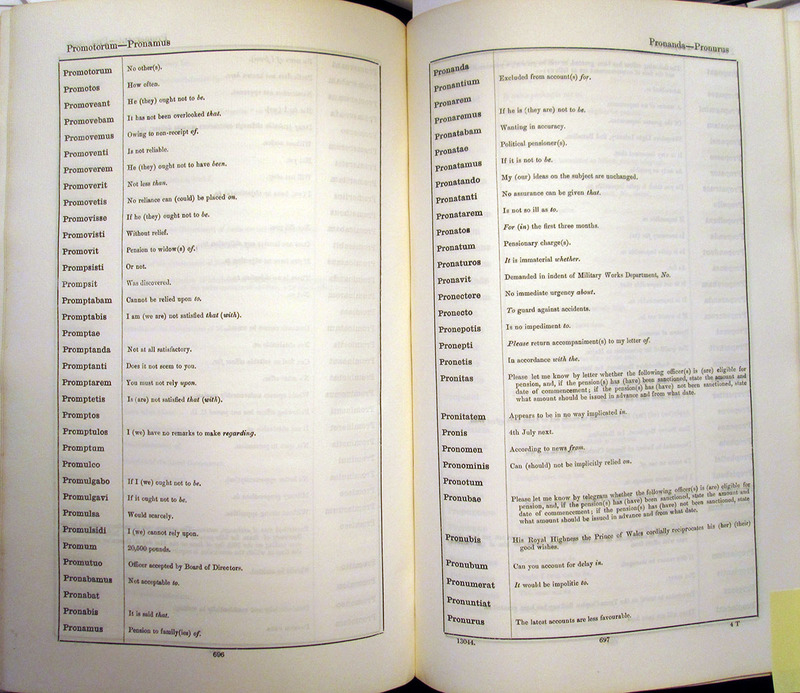 (Click here to for google scan of first page of first volume (of four) of the Offical Vocabulary, to open in separate tab or window.) These multi-syllabic (for built-in redundancy) codewords would soon be giving way to five-letter codes. Each codeword is twinned with a figure, so that the code might be used with the figure-to-safe-letter condensers of the time. Pages 2-54 are devoted to Numerals, Fractions and Whole Numbers, giving code substitutions for currency amounts (Pounds, Shillings and Pence “which can be used to denote any other Currency, or Weight, or Measure”) up to 46,000,000. The main part of the Code (pages 56-1100) is General Sentences, single words or phrases that can be combined into sentence form. 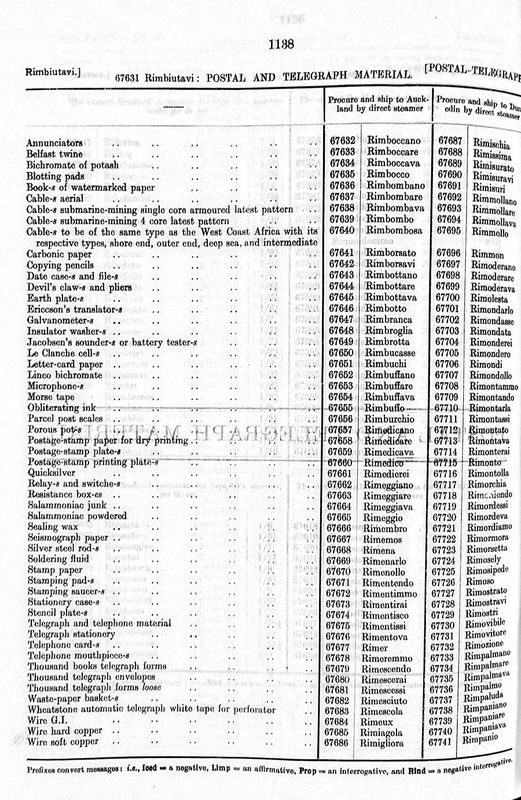 Pages 1102-1103 are Defence Material, including Rifles, Guns, Explosives, Cartridges and Projectiles. 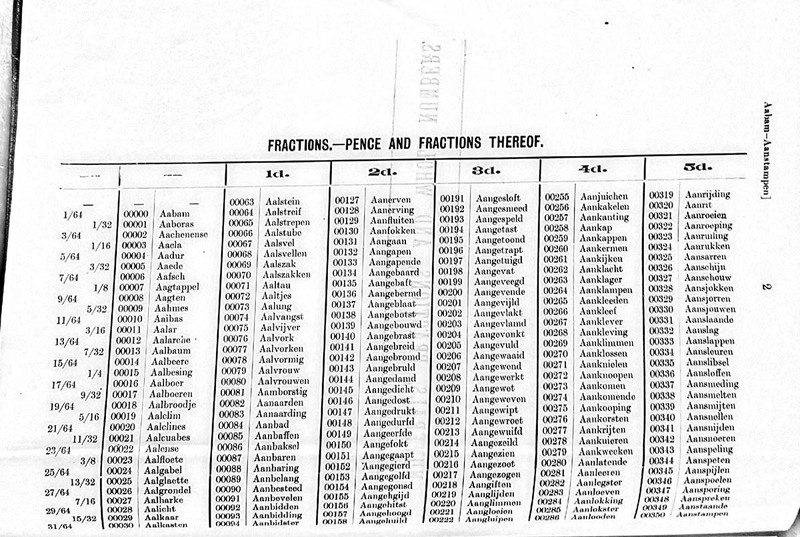 These are arranged in a Table: the rows are the stores items, and the four columns are for procurement and shipment to each of Auckland, Dunedin, Lyttelton and Wellington. Example: the code word Retrolego stands for “Procure and ship to Lyttelton by direct steamer: projectiles for 12-pounder Q.F. 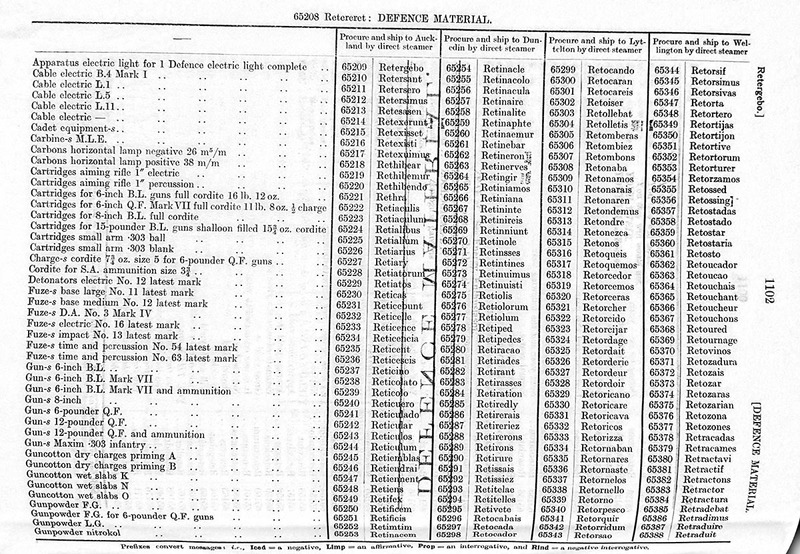 guns shells filled common pointed”, obviously with a further code word for the quantity required. 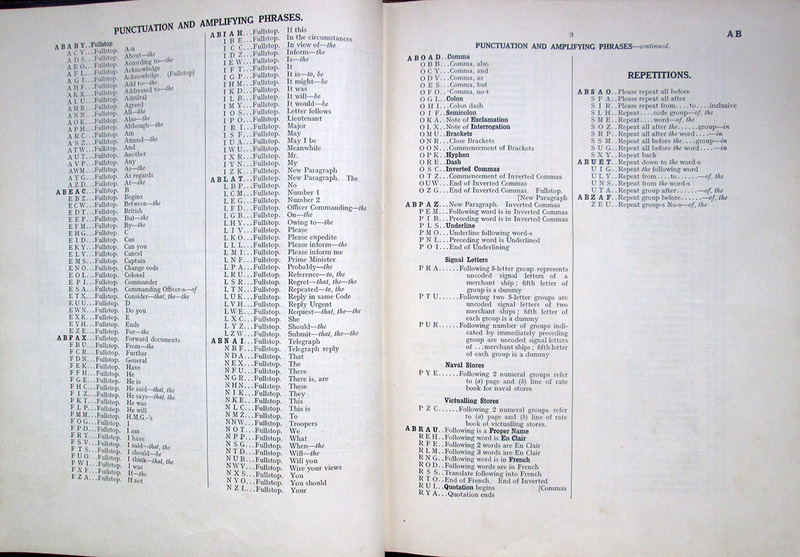 Pages 1106-1136 are for Industries and Commerce and are for market conditions and prices for a range of commodities, including Beans, Beef, Butter, Cheese, Cocksfoot Grass Seed, Hemp, Kauri Gum, Lamb, Mutton, Oats, Peas, Potatoes, Wheat and Wool. Broadly speaking, the entries are either descriptions of market conditions, or specific quotations of prices, or sometimes both. 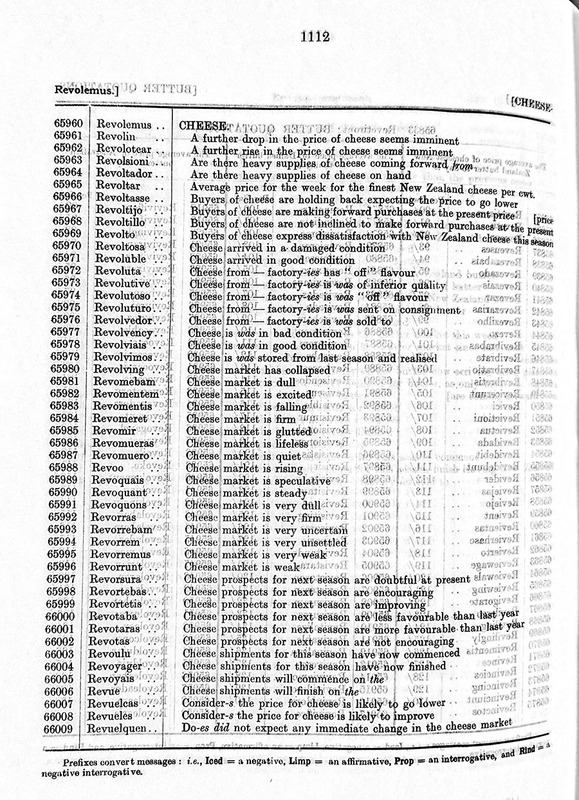 Examples: Reverist stands for “Buyers of butter express dissatisfaction with New Zealand butter this season”; while Revibrabas means “the average price of choicest New Zealand butter today is 101/- [101 shillings]”. 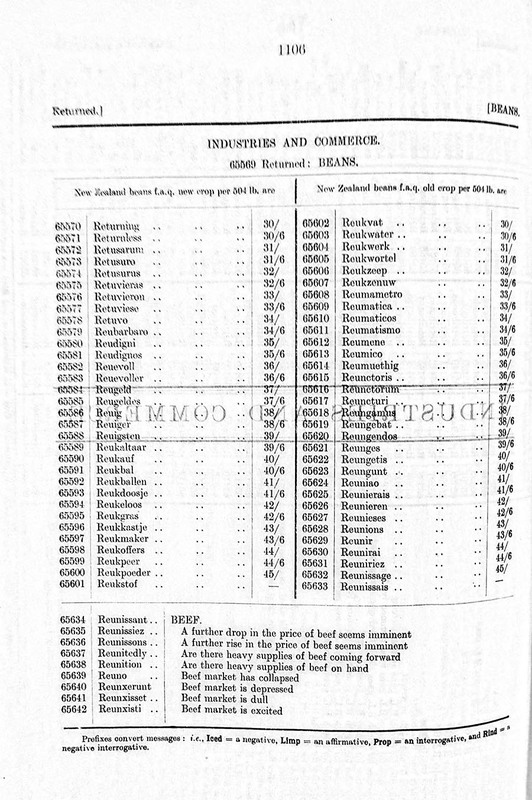 The remainder of the Code covers stores for Post and Telegraph (1138-1139), Printing and Stationery (1142-1152), and Railway and Public Works (1154-1161) organised similarly to the Defence Stores: rows with items and columns with procurement and shipping instructions. Use of this code would rely — as is always the case to some degree — on the judgement of the coding officer or clerk, in choosing for example from synonyms offered with the "catch" word. 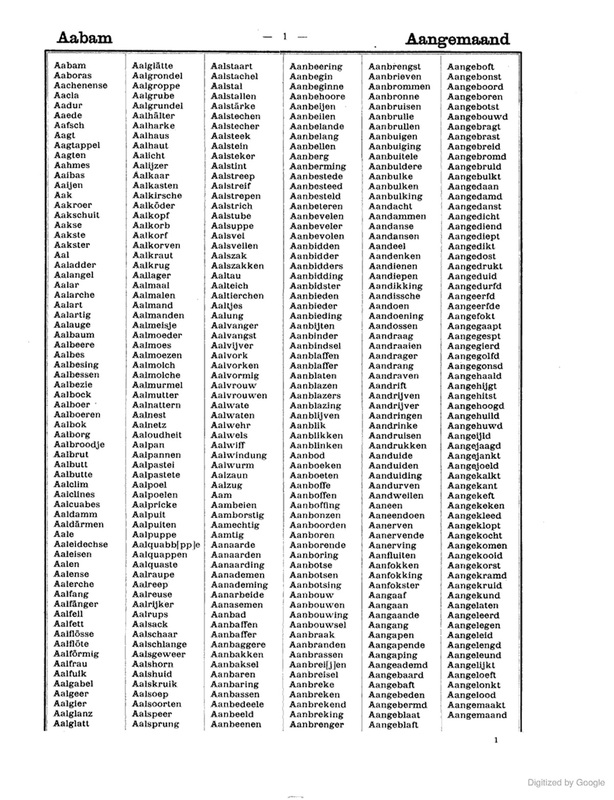 a five-letter code, phrases (their key words) in alphabetical order. two copies in private collection, one (missing pages iii-ix, and 5-7) bearing green and red tabs on outside and bottom margins, and heavily used; the other bearing no tabs, but containing all pages. 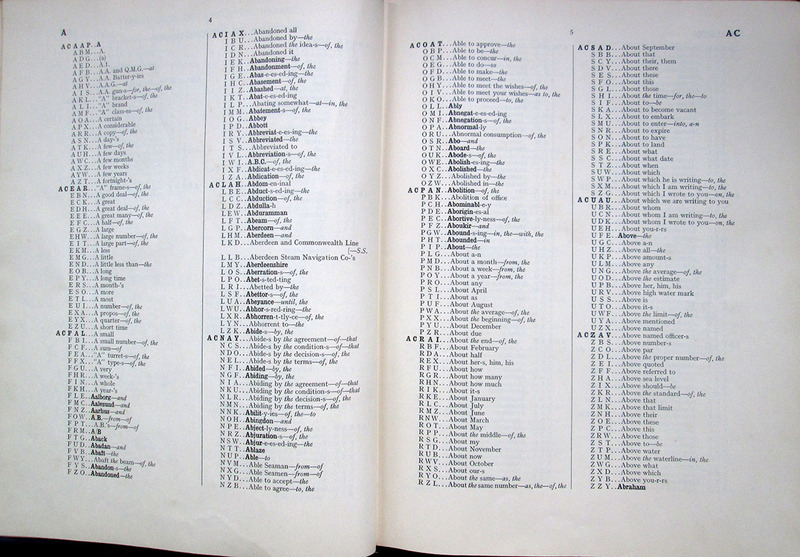 The preface on page iii explains that (1) this edition meets requirements of the 1932 (Madrid) regulations, under which code language must not exceed five letters in length; (2) uses any combination of vowels and consonants, permitting "the arrangement of the groups in a consistent order on each page;" and (3) the code groups are "constructed on an arithmetical system" that ensures a two-letter difference, and "no two groups can contain the same five letters with one pair of letters inverted." 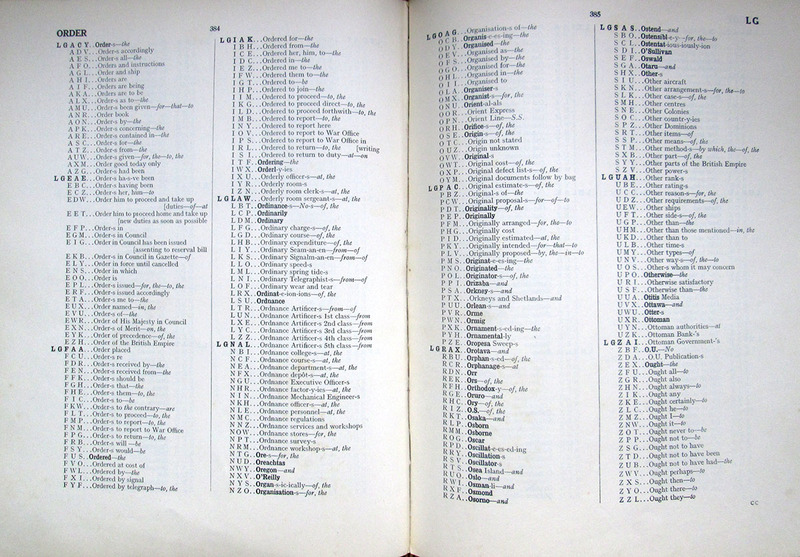 Furthermore, (4), lists of ships and military units are printed as a separate appendix; and (5) 5-letter groups in this code must not be used in the address. The Appendix was replaced at least four times (judging from what is stated in the appendices in the two copies in my collection). My "weathered" copy contains a 132-page Appendix dated 1958 ("To be brought into use on 1st September, 1959 in replacement of Appendix (1951)." Thus, the appendix appeared in different states in 1933 (the original date of publication), 1935, 1951, and 1959. There may, of course, have been more. 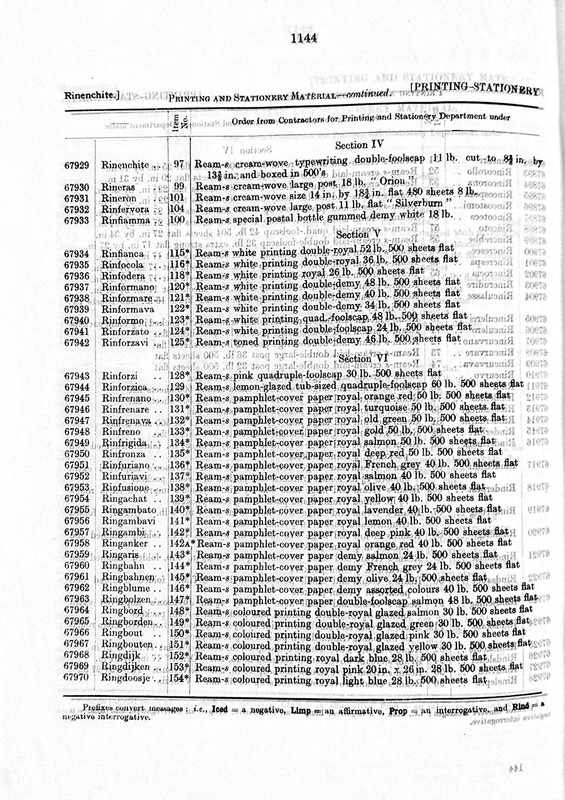 Specimen page spreads shown below.